UNESCO World Heritage Sites, a Vegas-like Strip, Macanese Food! Macau's main draw is without a doubt the casinos, so if you are not into gambling, is there anything in Macau worth a visit? More than anything, Macau is about enjoying the contrasting atmospheres, a mix of laid-back Mediterranean and hectic Chinese pace, beautiful and well-preserved colonial architecture, traditional Chinese temples and ultra-modern skyscrapers, great Macanese flavors and of course Chinese dim sum. 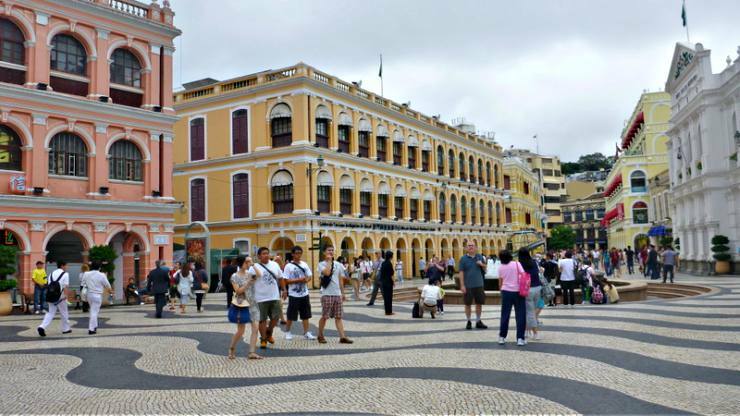 The Historic Center of Macau has been deemed a UNESCO World Heritage Site, which comprises many sites, temples and structures around the small peninsula. 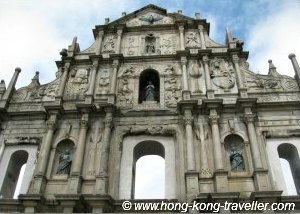 Perhaps the most iconic symbol of the city, all that remains from Macau's grandest church at the height of the colonial period is its beautifully carved façade and the stairway that leads to one of the most stunning views over the town. Built by the Jesuits, the church was destroyed by a fire in 1835, and what you see now is all that was left. Behind the Ruins, there is a small museum with many carved statues and paintings, as well as a crypt with the remains of the Christian martyrs. 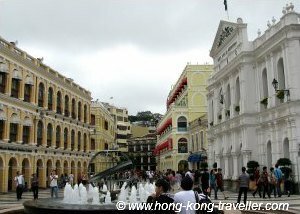 This is the heart of Macau, the main town square, surrounded by a collection of beautiful colonial buildings: the Loyal Senate Building, the main Post Office, beautiful churches, galleries, stores, even a Starbucks. This is a great starting point to exploring the city. You can take Bus #3 from the Ferry terminal to bring you here and then explore by foot the surrounding area. Also great for people watching, this is the spot to just enjoy the pulse of the city. The oldest temple in Macau, dedicated to the goddess A-ma, where the name Macau originates. 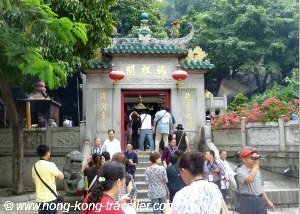 Also known as Tin Hau in Hong Kong, A-Ma is the Goddess of the Sea. 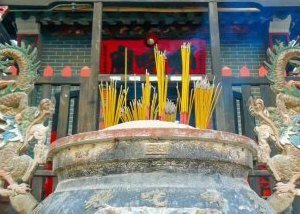 This temple is a favourite with locals and is well-frequented, always teeming with activity, burning incense coils and wish messages from the many worshipers coming to pay their respects. Standing at 338m high right at the edge of the peninsula, this is the centerpiece of a massive entertainment and restaurant complex. There is the usual viewing platforms and revolving restaurants with striking views of the surroundings. And for the adrenaline junkies out there, there is ne of the world's highest bungy jumps from the 233m platform, a stroll around the rail-less outer rim of the Skywalk, or a mast climb to the top... your pick. Some of these activities are quite popular and sell out early. If you have your heart set on one of them, it is a good idea to pre-book. 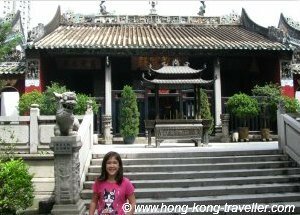 This temple is also dedicated to the Goddess of Mercy and is one of the most active temples in Macau. There are three main worship halls at this buddhist temple, all adorned with elaborate statues. In the back courtyard, there is the granite table where the first U.S-China trade treaty was signed in 1844. The casinos are the main scene in Macau, the only place in China where casinos are legal. The Vegas-style facilities and entertainment are a magnet to visitors from mainland China and Hong Kong. You will recognize all the big names in the gambling world: MGM, Wynn, Sands, etc. The casinos are found in the Southern end of the peninsula as well as in the newer area of the Cotai Strip, built specifically to boost Macau's standing as a world-class gambling, entertainment, and luxury shopping mecca. 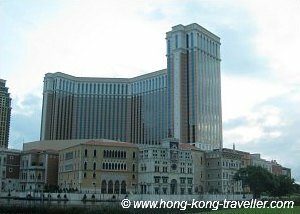 Casinos in the Macau peninsula: MGM Grand, Wynn, Sands, Grand Lisboa. 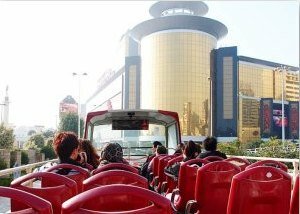 In the Cotai Strip we find the Venetian, the Galaxy, the Four Seasons, newcomer The Parisian Macau and the City of Dreams entertainment complex, including the Hard Rock Cafe. Getting to the casinos is a breeze as all will have their own free shuttles from the ferry terminals. If you want to catch a show, this is it. It's a breathtaking spectacle and the world's largest water extravaganza... Acrobatics, fountain jets, fantastic light works, stunning costumes... a real feast for the eyes. Created by the famed show-maker Franco Dragone, the show cost USD250 million to create and produce, and is only performed at the City of Dreams. There are two performances at 5:00 pm and 8:00 pm so it is possible to make it in a Day Trip from Hong Kong if you catch the early show. 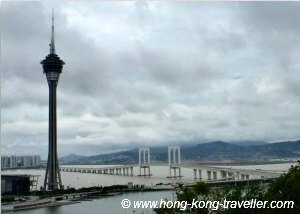 Getting to Macau from Hong Kong is very easy with convenient ferry service every 15 minutes. Here's more on the Hong Kong - Macau Ferry.